Star Jasmine is a fast growing evergreen vine. This vine does best with partial shade but will acclimated to a full sun location. It does require regular water but does not like to be over watered. 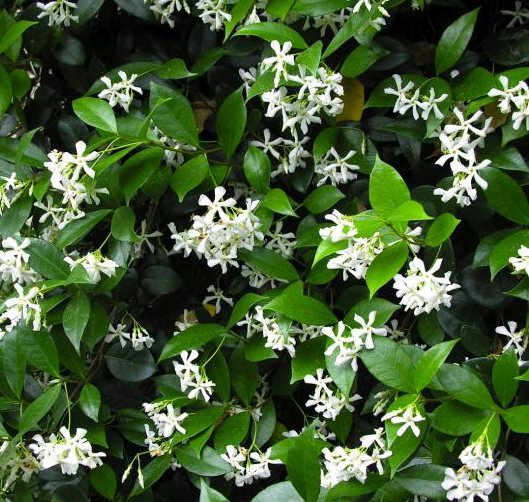 Star Jasmine needs help growing up a wall or trellis. It does not grab or wrap. It is also commonly used as ground cover or a shrub. It has small very fragrant white star shaped flowers in the spring. It can spread up to 20′ and is hardy to 25 degrees F. Low litter. Very Fragrant.